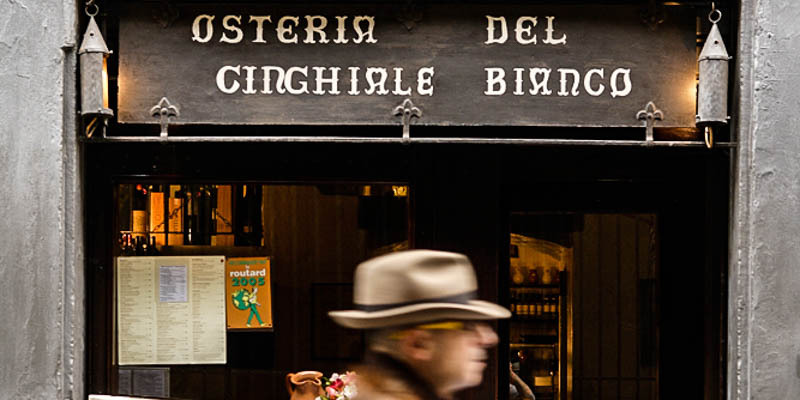 Osteria del Cinghiale Bianco restaurant in Florence. Massimo Masselli will sooner turn people away at the door than rush you though your meal. The place does a good repeat business of locals (including cooks from other restaurants) and tourists alike who come for the delicious taglierini (wide noodles) with pesto or the famous strozzapreti ("priest-chokers" made of the spinach-and-ricotta mix normally found inside ravioli, served with melted butter—so rich it would cause a priest, used to his meagre gruel, to choke on it). You can't go wrong ordering anything made of the restaurant's namesake cinghiale (wild boar)—from the cold boar slices as an appetizer to cinghiale alla maremmana con polenta (wild boar stew cozied up to creamy, firm polenta) as a main course. Set in the base of a 12th-century tower, this place milks its medieval look with exposed stone, odd iron implements hanging everywhere, and lights hidden in suspended cauldrons or the pigeon-holed walls.